Green Tortoise Hostels have been the favorite of backpackers and travelers for decades. From our unbeatable location in historic North Beach* (a few steps to tourist favorites like Chinatown, Little Italy and a quick walk to Fisherman's Wharf), to our cozy dorm rooms, to our relaxing private rooms, to our free meals, free beer nights and (in)famous pub crawls, to our famous Adventure Travel tours...these are just a few of the reasons the Tortoise has become a legend. *Some colorful adult entertainment clubs are located in our vicinity, also a busy & noisy area on the weekends from clubs on the street. If you're looking for a sterile, dull hostel that you can forget about the moment you leave San Francisco, the Tortoise isn't it. Time after time, our guests tell us that their favorite memories of San Francisco are of the times they spent in the hostel itself, meeting and hanging out with other backpackers, enjoying nights in our ballroom, making friends while enjoying our free dinners (3 times a week) or free Sangria (every Thursday! ), or dancing in the ballroom until all hours. If the sun comes up before you've gone to bed, you know you've had a good night at the Green Tortoise. Family owned and operated and dedicated to the traveler! More for the money & a unique san francisco experience! 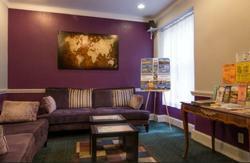 Free wifi throughout building & rooms! Solid beds, real mattresses, not foam! Free rice (Tue, Thurs, Sat & Sun) - on the days we don't have free dinners! Free maps & tour information! More of California and travel across the United States is easy to do with the offices of Green Tortoise adventure travel located behind the front desk, stop in and see where you can go in style! It should be noted that you are not viewing the Green Tortoise website, but rather that of a booking agency that we do not list all our availability or room types on. If you are having any problems booking please call us directly or go to our website to maximize your options. Walk ins are also welcome! 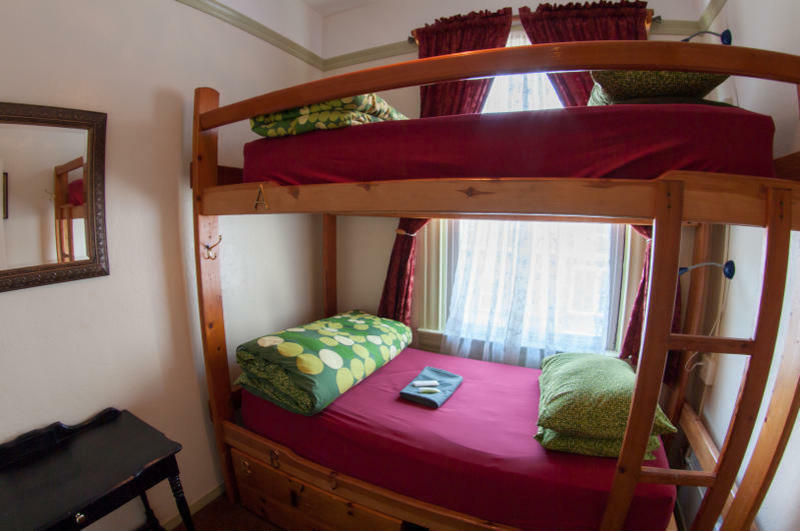 Our hostel is located in San Francisco, also home of green tortoise adventure travel and our sister hostel is located in Seattle on the market!! Important: we currently accept Visa*, Mastercard* and us cash for payment at the hostel. Sorry, no personal checks can be accepted. *A surcharge may apply if you pay by credit card. Please note that there is a $20 cash key deposit for each person which is returned upon checkout. The key deposit must be paid in cash. Sorry, but the key deposit cannot be put on your credit card. An additional 14% hotel tax will be added to your total reservation price at check-in on all private rooms and on dorm beds from may 27-Oct 15th & Dec 28 - Jan 1. A (TID - tourist improvement district tax) of 2.75% is also charged year long by the city. Checkout is at 11:00 am. Check in begins upon availability. Our luggage room is available for those times before and after. A discount parking coupon is available at check-in for a nearby parking garage. Shuttle Van: You do not need a reservation; just walk up to one and tell the driver you want to go to The Green Tortoise - 494 Broadway. Cost is $19. 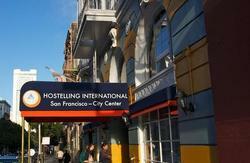 Returning to SFO Airport: Shuttle bookings available at the hostel front desk $14 per person. BART train - Costs $8.25 - Takes 30 Min. Exit at Montgomery, walk 1 mile north to Broadway or take a taxi from Montgomery BART station to our hostel (approx $8-9). Taxi from the airport: will cost: $45 -$50. Take the Air Bart shuttle ($5) to the BART station. From here get any San Francisco bound train and exit at Montgomery. Walk one block away from the clock tower to Kearny and turn right. Walk 1 mile north to Broadway or get the Muni Bus #8x and get off at Broadway. Walk 1 block East to kearny St, (towards water), we are located upstairs at 494 Broadway St.
From the Greyhound station - The Greyhound station is located on Folsom and Main streets. If you prefer to take a taxi the fare should be less than $10. Otherwise, you can walk (25-30 min.) - walk east on Folsom street and turn left on Embarcadero. Walk up Embarcadero and turn left on Broadway and walk about 6 blocks to Broadway and Kearny, we are on the right side. Or you can take the city MUNI bus #41 ($2.00) from the corner of Main and Howard. It will drop you by the Condor bar on Broadway and Columbus. Walk 1 block to 494 Broadway. Walking (1.3 miles): Walk up First Street to Market Street (the direction is against the flow of traffic on the one way street). Cross Market and First Street changes names to Battery Street. Continue walking north up Battery until you come to Broadway (10 minutes). Turn left on Broadway and walk 3 blocks to 494 Broadway. (The Green Tortoise recommends returning your rental car after you have reached San Francisco or renting one after your stay at our hostel. Having a car in San Francisco is unnecessary and expensive!) If you do have your own car, or a rental car please call us for parking information before you arrive. + 1 (415) 834 1000. We have a deal with a garage nearby, so you will need to come to the hostel first for a discount coupon and unload your bags. Price ranges from $20-30 depending on size of vehicle. We also encourage you to go online to www.sfmta.com to familiarize yourself with parking regulations in San Francisco. Once in the site click on Parking, then enforcement to check on parking tips. You can also click on 'where to park'. A list of public garages for San Francisco is available. We are in North Beach and there are a number of other garages close to our hostel that range from $10-25 per 12-24 hrs depending on the day of the week. Parking can be free overnight in some areas, but park at your own risk. You must be aware of all signs, curb colors, street cleaning, tow away zones and regulations. Take 101 North, As You Pass Army Street (Ceasar Chavez) There Will Be 4 Lanes. Stay In Lane 2 (Second From Right) Follow All The Way Until It Becomes Exit Only At 4th Street (When Lane 1 Disappears At 7th St, Don't Change Lanes) Exit At 4th St Exit But Curve Left Onto Bryant (Not Right Onto 4th) Take Bryant 1 Block And Turn Left On 3rd St. Follow 3rd All The Way To Market And As You Cross Market It Becomes Kearny. Follow Kearny To Broadway. Take Golden Gate Bridge To Lombard, Left Onto Lombard, Follow Lombard To Van Ness, Turn Right On Van Ness, Follow Van Ness To Broadway, Turn Left On Broadway, Follow Broadway To Kearny.